Good Morning! How's your week so far? Mine is going pretty well. I get off work a little early today for the craft sale that I've been working to get ready for and then I'm off tomorrow. What a great way to start the weekend, right? Cross your fingers for me that I do well with my sale. I really need some new Copics and I need to Christmas money, so I've go to sell sell sell. Fun sketch, right? 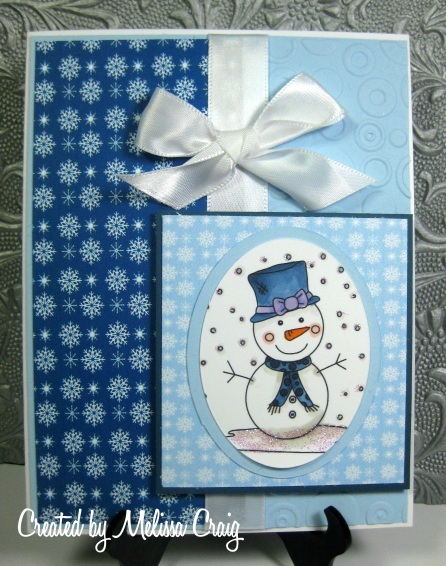 I am featuring the sweet snowgirl image, Made of Snow and the free digi paper Snowflakes (it comes in a great assortment of colors). This card was really easy to put together, you'll find that all the Pretty Patterns are stamper friendly and so much room for creativity and interpretation. Have fun!